Savour a four-course culinary feast, featuring famous Nova Scotia lobster, Digby scallops and local wines, spirits and micro-brews during an exclusive after-hours tour of Port Royal National Historic Site. 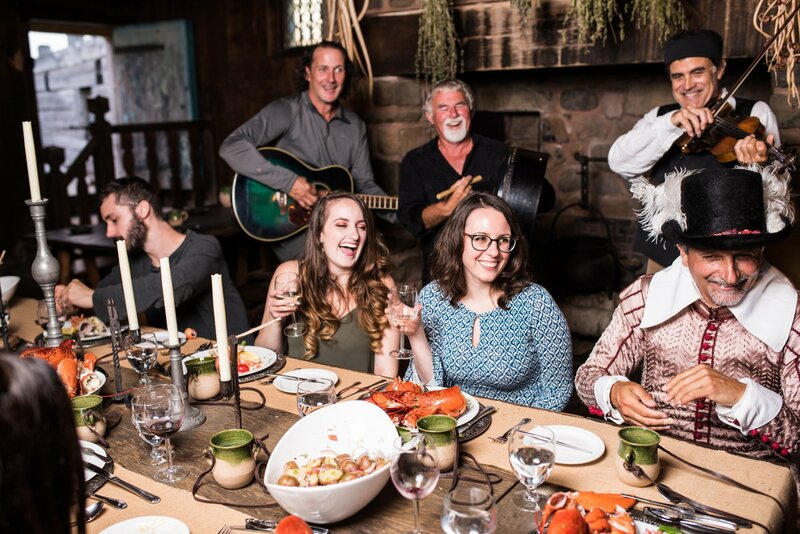 Share stories, listen to live music and be taken back in time with Champlain himself to dine like it's 1606. While visiting the site of the first permanent European settlement in Canada you will be immersed in food and culture. When you arrive at the Habitation at Port Royal, where Samuel de Champlain initiated the Order of Good Cheer in 1606, be greeted by Champlain himself. He will take you on a private tour of this stunning site, and will introduce you to friends along the way. You’ll be sharing stories and culinary delights as you also interact with Mi’kmaq and Acadian cultures. Dinner will take place in a century-old dining room where you will feast like it’s 1606, cheers! Afterhours access with private tour: As Champlain opens the doors for your exclusive evening experience, they close to the public. You will gain unique insight into the significance of Port Royal in the initial settlement by European’s in North America. Transportation: Private shuttle service will be provided from Annapolis Royal so that participants can fully partake in all aspects of the experience. Vans will depart at 5:15 pm and return at approximately 9:30 pm. Four-course feast: Party like it's 1606 during a feast like you have never experienced featuring lobster, scallops and Nova Scotia wines, spirits and micro-brews. We can accommodate alternative dinner options. Note: Some products are subject to availability and substitutions may be required. A Taste of Mi’kmaq and Acadian Cultures: You will have an interactive activity with a Mi’kmaq person, and participate in a musical interlude featuring Acadian songs. Order of Good Time: Champlain will induct you into one of the oldest social clubs in North America, the Order of Good Time. Please note that while the intention of this experience is to showcase local seafood, special arrangements can be made to accommodate anyone who is unable to consume seafood. Please call 902-526-3888 for more information, or click on the button below to subscribe to the Good Cheer Adventures E-Newsletter for further updates on this experience and other things that we have planned. Hillsdale House Inn will be holding a few rooms at a special discount to anyone who would also like to enjoy an overnight stay in conjunction with their experience. To check availability and reserve, please email reservations@hillsdalehouseinn.ca or call 1-877-839-2821.